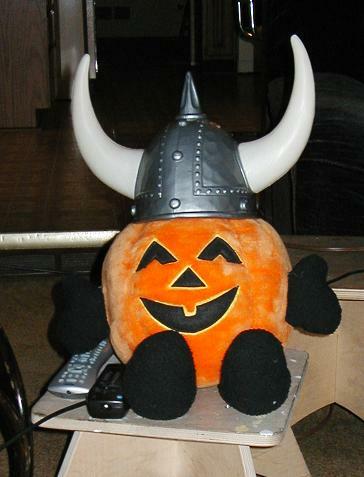 Mr. Pumpkin was so happy before the game last night. He had a big smile on his face, his horn helmet on his head, and his remote controls at the ready. He knew if the Vikings won their last two games and got just a little help, they’d be in the playoffs despite their bad start and all the off the field distractions this season. He was hopeful. He watched the game. He watched the Ravens beat the Vikings. He was disappointed. But, because he’s Mr. Pumpkin, he still has a big smile on his face. One year ago, a gift quilt was the star. Two years ago, I went fabric shopping. Three years ago, I ‘fessed up.